A super touching movie. It’s advisable for gals to bring packets of tissue if you are a dog lover and have a loose tear gland. The dogs are soo intelligent. Makes me miss my old dog so much, Walby *sobSob* It’s not a chick flick. Very nice. No words for it. 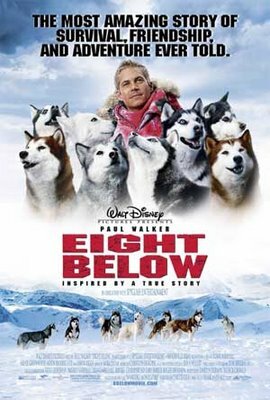 Hats off to the real dogs that survive the ordeal as this movie is based on a true story. Sypnosis: A scientist and a guide sets out on an expedition to search for a meteorite in the South Pole. Half way through, the biggest storm in history hits. They had to leave the dogs there when they return to base camp as there’s no space in the aircraft. The other half of the movie follows the life of the dogs surviving in the snow storm, loyally waiting for their owner. Aiyoh, this type of movies will make me cry! I have a very soft spot for doggies.